To provide a safe, creative and welcoming place for all people of the Upper Skeena to gather regardless of age or background; and to address the educational, health and social needs of our communities, utilizing the platform of wellness, recreation and sport as a catalyst for dialogue, hope and action. The Upper Skeena Recreation Centre will be the physical and emotional Heart of the Hazeltons. It will be the centre of activity; appealing, inviting and accessible to all residents of the regional community, as well as guests and visitors, contributing to their physical and mental health, education and economic well-being. As the Heart of the Hazeltons, it will be the catalyst for collaboration among all peoples. The Upper Skeena region represents of British Columbia’s most rugged and one of the most majestic areas of the world. In its midst are the world renown Skeena, Bulkley and Kispiox rivers which provide breath-taking experiences for global tourists, power to light and heat millions, and carry vast resources through their respective fisheries. Surrounding these rivers is a complex network of mountain ranges, and sanctuaries for wildlife, birds and humans. In the midst of this natural beauty is a place with tremendous Gitxsan heritage, accompanied by the pioneer spirit of settlers, who have lived and persevered together, with a resilience that has uniquely bonded them together. Today, the Upper Skeena region is experiencing its greatest challenges. Confronted by crushing unemployment, often catastrophic health issues, and low education outcomes, there is much pain. On the immediate horizon, there are many economic opportunities which may bring change including new LNG pipelines, vast mining exploration for base and precious metals, power generation by harnessing its rivers, multi-modal transportation systems, and a truly world-class eco-tourism industry. The region also celebrates its Gitxsan traditions, culture and people who have lived as one with the land through the millennia. As the local, regional and Gitxsan governments look to the future, they are addressing these challenges and opportunities, with a new approach – recognizing that they are stronger together. At the forefront of their collaboration is addressing the health and well-being of the region’s citizens, with a specific focus upon its dominant youth population. With limited facilities and expertise, these leaders have developed a strategy known as the Heart of the Hazeltons, which includes the replacement of a 50-year old volunteer built ice arena, with a year-round community recreation centre. This new facility, presently called the Upper Skeena Recreation Centre, will include programs and services for all ages, all sporting and cultural interests and, serve as a gathering place for its people, extend the collaborative approaches to the Coast Mountain School District, Northwest Community College, Northern Health, Gitxsan Health, VIA Sport, Pacific Sport North and a growing array of community organizations seeking a way to foster social change as they pursue their mission. Most importantly, the Heart of the Hazeltons will give to these people, what some feel has been lost – a spirit of hope. As the catalyst for collaboration and the beginning of important social change, the Heart of the Hazeltons initiative involves a total capital investment of $16 million and an operational trust of $2.0 million. To demonstrate the strength of its commitment and leadership, the local and regional governments (Regional District of Kitimat Stikine, Village of Hazelton, and District of New Hazelton) have already committed over $2.0 million towards this goal. In addition, the Gitxsan Government Commission (elected chiefs) has contributed $500,000 and the Gitxsan Hereditary Chiefs have committed over $350,000 towards the preliminary design of the Upper Skeena Recreation Centre, and to augment programs and services in the existing facility. These agencies have also pledged their long-term commitment to provide operational support of the Upper Skeena Recreation Centre to ensure its maximum and optimal use. Considering the extremely limited tax base of the region, these contributions are extraordinary. Work with the Government of British Columbia and the Government of Canada to secure additional support for the capital costs of the Upper Skeena Recreation Centre and its ongoing operations are also advancing well, with new federal-provincial infrastructure programs on the immediate horizon. A contribution of $12 million is being sought towards the capital costs from senior government. 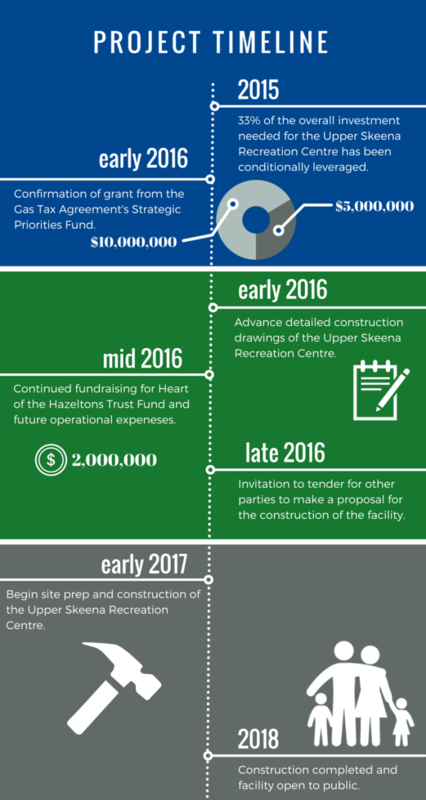 Between $4.0 million to $5.0 million in the Upper Skeena Recreation Centre is expected to be raised through philanthropic, naming and sponsorship support through a campaign initiative, most appropriately identified as the Heart of the Hazeltons. This support is anticipated to come from philanthropic sources, including individuals, industry, foundation and community interests, and will be used towards the construction of the Upper Skeena Recreation Centre, and to further complement the funding needs for ongoing health and wellness, recreation and sport, and other related programs. To date, nearly $2.0 million in philanthropic support has also been committed. The Upper Skeena Recreation Centre will be developed adjacent to the existing arena, creating a year-round integrated community enterprise that is in close proximity to the local high school, a campus of North West Community College and to Wrinch Memorial Hospital. The lands were donated for the intended purpose of foster better health and quality of life for the entire Upper Skeena population. An innovative joint owner-operator model has been established between the Regional District, local governments and the Gitxsan. To maximize its effectiveness in management and eligibility for multi-level governmental support, the Upper Skeena Recreation Centre will be owned in trust by the Regional District of Kitimat Stikine, and operated in concert by the local and Gitxsan governments, including the Skeena Ice Arena Society (which operates the existing arena). Together, these governing agencies have established an Owners Group to guide the capital project and ongoing operations of the Upper Skeena Recreation Centre, and a more comprehensive expression of the entire Heart of the Hazeltons initiative. the BC Wood Council has designed a proto-type facility, with specific consideration for the needs of the Upper Skeena region. This design work has been officially adopted by the Owners Group, providing considerable savings to both the architectural and engineering costs, as well as an expedited construction timeline. As such, the Upper Skeena Recreation Centre is targeted for completion by Fall 2018. The Owners Group have pledged to make the Heart of the Hazeltons a proto-type for the benefit of other British Columbia communities. The entire project (governance, ownership, project development and operations model) will be well documented and transparent for other prospective communities to examine. It is important to recognize that a collaborative, multi-level governmental approach while seemingly common-sense is in itself an innovation. By looking beyond the boundaries of policy and regulation, the local, regional and First Nations governing parties setting the pathways for solutions that will sustain cultures and people groups, change the paradigms of poor health, linked to low levels of education performance, and the corresponding high unemployment, and foster a new-found outlook of hope for a better future. Add to this the ongoing work of engaging health, education, cultural, sport and recreation agencies, and a true-network of integrated programs and services will be embodied in the Heart of the Hazeltons. Beyond the noted leadership of the respective governing agencies, the Heart of the Hazeltons is blessed with the visionary commitment of Dr. Peter Newbery as the voluntary chair to guide the entire enterprise. Dr. Newbery, a 40-year resident of the Hazelton region and family physician, is a nationally and internationally recognized expert in the practice of rural family medicine. Throughout his career he has focused on meeting the medical needs of underserved communities from the inner city to the remote communities of coastal and northern B.C. 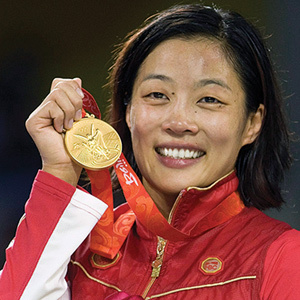 In addition, a home grown product of the Upper Skeena, and two-time Olympian and medallist, Carol Huynh is serving as the Honorary Chair of the Heart of the Hazeltons initiative. Now that she has achieved her goal of competing for Canada as an Olympian, Carol is dedicated her life and career to the advancement of sport as an important platform for leadership and the pursuit of excellence. Joining these world citizens is a cabinet of other local, national and international leaders who share in their belief in and support of the Upper Skeena. 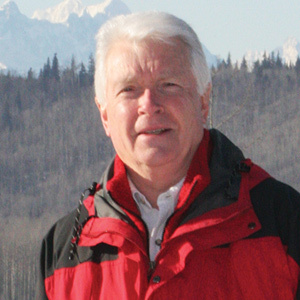 There is tremendous opportunity for natural resource development across the Upper Skeena. The Heart of the Hazeltons initiative will help prepare the population, of which 80% is working age, to participate in the industrial and other development. In addition, with an anticipated influx of industrial workers, the Heart of the Hazeltons will help ensure there is a higher order of readiness to welcome these people, and to offer them quality of life experiences to which they are accustomed at home. Beyond the construction of the Upper Skeena Recreation Centre, the Owners Group is already developing plans, strategies and actions to mobilize change now. The hiring of program professionals and the shared commitment of leadership and operating investments will help to ensure there is maximum impact through the Heart of the Hazeltons initiative. Towards this objective, it is anticipated that an annual operating budget of $250,000 will be required for the facility and the associated programs. The local, regional and First Nations governmental commitments already represent approximately 50% of this total, with additional support anticipated from other local and regional agencies, ongoing local philanthropic support and sponsorships, and augmented by user fees. The willingness of local and regional governments to shed their traditional territorial boundaries, and to work collectively with the Gitxsan Government Commission (elected chiefs) and the Gitxsan Hereditary Chiefs represents a new path that few, if any other communities have taken on. With an immediate goal and a long term vision to protect the Gitxsan traditions, while at the same time embracing the growing diversity of its residents, and the emergence of new future economic opportunities, there is further opportunity for the Heart of the Hazeltons to be an important catalyst for dialogue, planning, programming and a sustainable, monumental change for this vitally important place for all British Columbians and all Canadians to celebrate. Many of us involved in minor hockey in the Hazeltons have great memories of our current ice arena. It has served us well as a place for the community to come together as friends and family to pursue our passion for Canada’s Game. Sadly, our old barn is simply not sufficient for our needs anymore and needs to be replaced. We have contributed to, and followed closely, the effort to build a new arena, and there is a sense of excited anticipation amongst our hockey family at the prospect of a new facility. They see not only a new building, but a rallying point for the people of Hazelton to come together and once again cheer on our children, and show our pride in our town. Click the page navigation buttons to view all pages of the PDF.